Myanmar held a state ceremony here Thursday to mark the country's 71st Martyrs' Day, commemorating fallen national heroes including General Aung San and eight others who sacrificed their lives in 1947 for regaining the country's independence. General Aung San was also founder of Myanmar's armed forces. With Myanmar's national flag flown half-mast, the state ceremony was attended by First Vice President U Myint Swe, Speaker of the House of Representatives (Lower House) U T Khun Myat, Speaker of the House of Nationalities U Mann Win Khaing Than, Chief Justice U Tun Tun Oo and Commander-in-Chief of the Defense Services Sen-Gen Min Aung Hlaing. 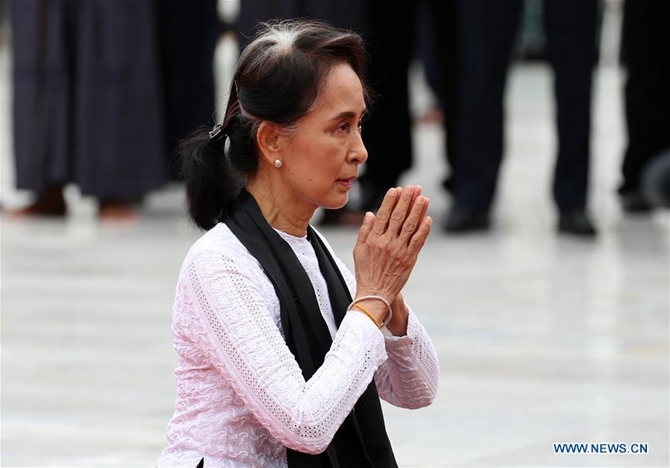 State Counselor Aung San Suu Kyi, daughter of General Aung San, laid wreathes at the tombs as status of a bereaved family member among others. Yangon Region Chief Minister U Phyo Min Thein as well as representatives of political parties and different walks of life joined the event. A siren was sounded by Myanmar Radio and Television to observe the time of the assassination of the martyrs. Following the official ceremony, the martyrs' mausoleum was open to the public and General Aung San's Museum kept open for commemorative visit. General Aung San, along with eight others including his bodyguard and seven councilor members, were all assassinated at Yangon's then Prime Ministers Office on July 19, 1947 before Myanmar regained independence from the British colonialist on Jan. 4, 1948.